The following interview conducted by Christina Brooks was carried in the London Progressive Journal, which can be read on-line here. There is a lot of confusion about whether the bailouts of banks such as Bradford & Bingley and Northern Rock are examples of socialism. Would you say this is what Chair of the Campaign for a New Workers� Party (CNWP), Councillor Dave Nellist, calls 'socialism for the rich'? I would agree with how Dave Nellist has put it; this is socialism for the rich in the sense that public money is being used to protect private interests � the state takes responsibility for any losses while the profits stay in private hands. We�re in a situation now where the greedy, reckless speculating of a tiny handful of bankers and hedge fund managers has brought the world economy to the brink of a financial disaster unseen since the 1929 crash and yet its ordinary working people who are shouldering the burden. Anger amongst working people is huge yet we�re expected to sit on the sidelines and watch whilst the establishment parties use our cash to bailout private companies that would have cried foul at the slightest state intervention just over a year ago! The main reason why they�ve been able to get away with it so far is because working people have been denied a political voice, so the anger that is felt hasn�t been given a mass, organized channel. That�s why the campaign for a new workers� party is central to the current situation; if socialism is good enough for the rich then its good enough for the rest of us but we need a vehicle in order to make our voices heard and fight for it. How would the CNWP's bank nationalisation differ from New Labour's bank nationalisations? Since it was taken over by the government, Northern Rock has been giving nationalization a bad name! They installed a non-domicile chief executive who hasn�t paid a penny of tax towards the Rocks bailout, they�ve laid off thousands of staff and they were responsible for more than 10% of all house repossessions in 2008! Then, when the �500bn bank bailout was announced initially we weren�t going to get any representation on boards of directors for our cash; in the face of public outcry, Brown changed his position on this but insisted that the governments boardroom representatives would �come from a financial background�. Really, asking a banker to keep an eye on other bankers is like asking a robber to oversee a gang of thieves! What�s really needed is genuine nationalisation of the banking system with popular committees of workers, small savers and the community overseeing the day-to-day running of the bank in the interests of the majority, not a clique of suited and booted spivs who fire and evict with an eye on their profit margins. Imagine how a publically owned and democratically run bank could be used; rather than turfing people out onto the streets when they fall behind on mortgage payments it could buy up houses and negotiate a social rent, it could offer low or zero interest loans to help those in financial difficulty, it could be used to benefit the majority rather than contributing to the spiral of misery stemming from the recession we�re now in. How would the CNWP stop the factors that led to the present financial crisis, such as lack of regulation, federal deficits, lowering interest rates, and sub-prime mortgage lending? The current crisis has been enormously exacerbated because for the last two decades the minority of super-rich at the top of society have been given free reign � their political representatives have pursued ruthless neo-liberal measures of privatization and deregulation. In the past, however imperfect it was, the Labour Party and in particular the grass-roots of the workers movement around it meant that the bosses at least had to look over their shoulder. Now New Labour is an out-and-out party of big business and no such check exists. At the very least, a strong mass working-class party would act to curb the excess of those at the top that has steered us into this economic iceberg but more than that it would be a channel through which workers could collectively pursue their interest, which are diametrically opposed to the interests of the fat cats who have created the mess we�re in now. How are pensions threatened and how would the CNWP protect them? The collapse in the stock market means that a worker retiring now would draw a pension worth over one third less than if they had retired twelve months ago! It�s fairly simple really, the pensions industry should be nationalized and workers pensions should be protected, or are we not as important as the bankers that Browns bailed out? Workers in car and parts manufacturing plants across the country are facing short time, pay cuts and job losses. Just the other week, a further 1200 redundancies were announced at Nissan in Sunderland; those being laid off are predominantly younger workers on worse terms and conditions or agency staff. These are skilled workers kicked on the scrap heap, joining the growing queue outside the dole office. In Coventry, when the Rover plant was shut down a few years ago workers were promised that investment in the area would create new jobs but the single biggest new employer since then has been Tesco! Many skilled manual workers now stack shelves for little more than the minimum wage; what a disgusting waste of talent! Why can�t the car industry be taken into democratic public ownership? Sales of cars are down but public transport across the UK is overpriced and inefficient; let�s use their skills to create a new generation of cheap, green buses and trains, as well as developing environmentally friendly cars. This seems like simple common sense, but it won�t be heard from the lips of any New Labour, Tory or Liberal creature � a new mass political force could very quickly transform the lexicon of political debate in this country simply by being able to put across working-class policies on a national scale that have been forced off the agenda for too long now. Dave Nellist calls the free market system the traditional enemy of the people. However, perceptions about the early history of socialism have led to the adage that a lassez-faire economy is efficient. Can a planned economy or partially planned economy work? Nowadays, you�d be hard pushed to find an establishment politician that would boldly defend �lassez-faire� economics � the neo-liberal free market model has been decisively undermined by the financial crisis in the eyes of millions. For a small but growing layer, it is not just the neo-liberal model but capitalism itself that has been brought into question. The aim of the CNWP is a simple one; to fight for a political voice for working people, within the campaign there are different shades of opinion united behind the idea that the working class needs to create a new mass political organisation that can further its interests. When that new party comes about, there will be debates and discussions within it about exactly what sort of society is needed to provide a decent standard of living for the majority and how we can go about achieving it. I personally believe that capitalism is a rotten system that has been proved inefficient and incapable of providing that standard, based as it is on exploitation and production for profit, not need. I believe that we need a complete transformation society; a socialist world based on planning and cooperation to meet people�s needs. Within a new party, myself and other socialists would argue for that � public ownership, planning and accountability. But central to the success of a new party is that its open, inviting and democratic and those policies are decided upon by its membership, not imposed before it comes about. Would the CNWP promote its values within the international community? It already does! Our 2008 conference received messages of support from members of the Left Party in Germany, the New Anti-capitalist Party in France and the Party of Socialism and Liberty in Brazil � all of which are examples of other projects that are taking place across the globe fighting for a working-class political voice as we are. The acceptance of the market by New Labour and its transformation into a party of big business has been replicated amongst most of the former-Social Democratic parties internationally; our struggle is a global one and supporters of the CNWP follow with great interest these developments. Solidarity with workers worldwide is the best way to promote the values of the CNWP. Has public interest in the CNWP been increasing since the financial crisis? Among which segments of the population? Yes. 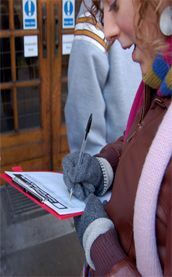 We gain new members and supporters every day; if anyone reading this wants to get involved they should start by signing up on our website at www.cnwp.org.uk. Car workers, retail workers and many others already directly hit by the recession have drawn the conclusion that none of the establishment parties have their interests at heart and have joined the campaign. Also, public sector workers and civil servants who have faced countless attacks at the hands of the New Labour government have drawn the conclusion that as well as an industrial struggle against these attacks we need a political struggle to pursue workers interests. They have also joined the campaign. In particular, many young people have signed up to the CNWP. This is the first generation since before Victorian times that faces an overall drop in standards of living compared to their parents; the fight for a political voice is the fight for our future! What has the CNWP been doing to engage new interest? In workplaces, communities, schools and colleges across the country, supporters of the CNWP are engaged in countless campaigns. Throughout all of these we raise the need for a political force that can unite these struggles and give new layers of workers the confidence to fight back. In the trade union movement we are vociferous in our demand to break the financial link with New Labour and take steps towards forming a new working-class party � supporters of the CNWP were able to force a debate on financing Labour at both the UNISON and CWU conferences last year. Without the role that our campaign has played, these arguments would not have been heard. In the PCS and RMT in particular our supporters are campaigning for a conference of trade unionists to discuss fielding anti-cuts, anti-privatisation candidates in elections and moving towards the establishment of a mass political force that puts working people�s interests above those of the bosses. The uncertainty of a recession and all the suffering it will bring makes our demands more urgent than ever now; if you agree; you should get active and join the campaign.